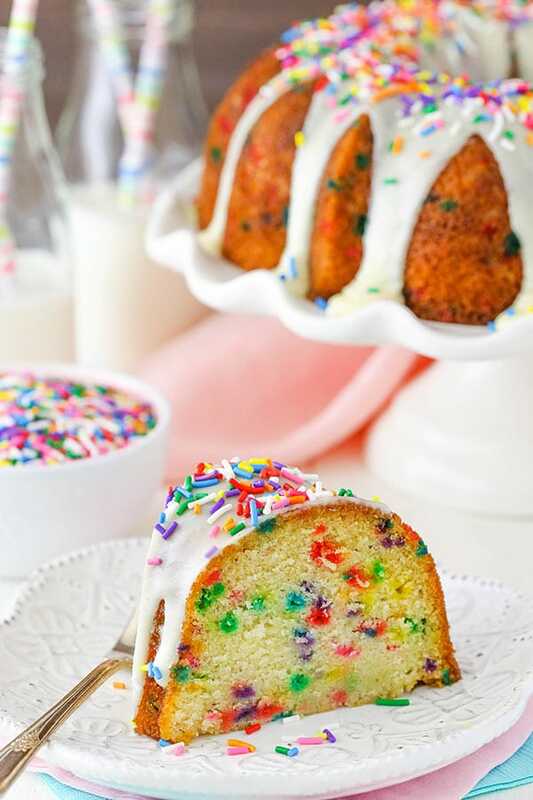 This Funfetti Bundt Cake is moist and full of flavor and sprinkles! It’s easy to make and sure to brighten any day with all the fun colors! So we are supposed to have some painters coming to the house today to paint the inside of the house and redo some of the paining on the outside. Unfortunately the painters haven’t been terribly great about communicating, so I imagine tomorrow will mainly consist of figuring things out and getting paint colors selected and purchased. I’m a little unsure of how the whole thing will go since we’ve done all other painting in the past ourselves. I imagine the house being a bit torn apart, furniture everywhere and general chaos. I am excited to see it all finished though! 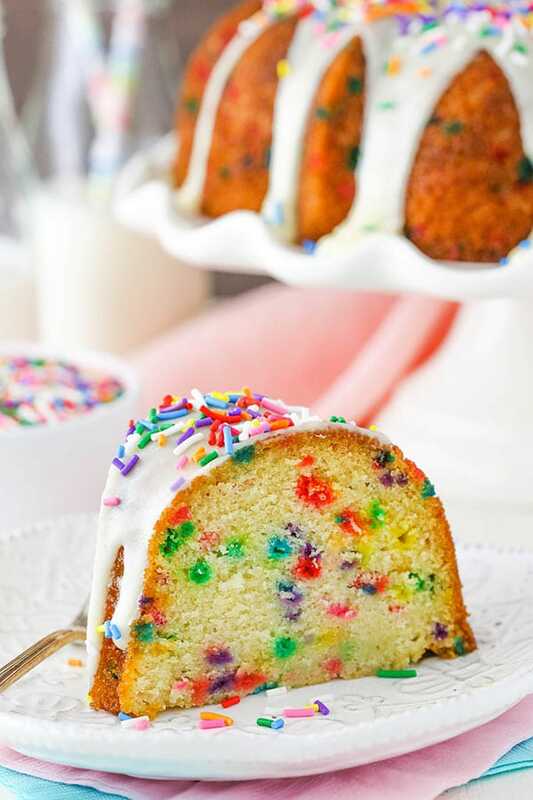 But not to worry for now, we’ve got Funfetti Bundt Cake! For the cake batter, it’s relatively straight forward. Just be sure to fully cream the butter and sugar together and the rest should be a breeze. 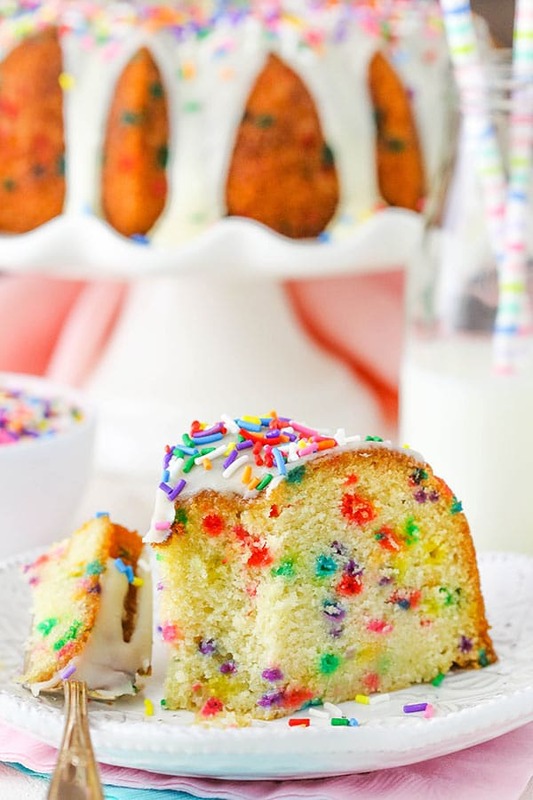 Fill the batter with sprinkles and you’ve got a super festive and colorful cake great for any occasion – even a Monday night. The icing is one of my favorites to use. It doesn’t just soak into the cake. It’ll last for days and look nice, plus it tastes great. It just takes a touch more effort by cooking it on the stove for a few minutes. 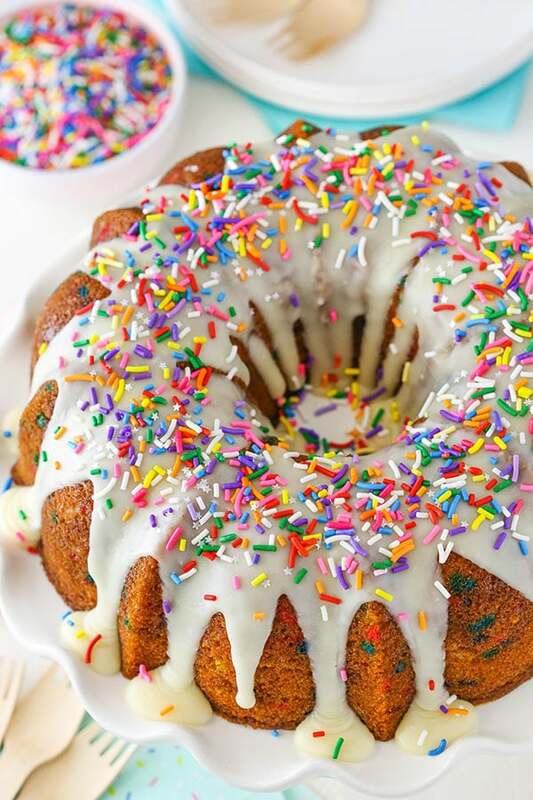 Once you’ve drizzled the icing on the cake, cover it with your favorite sprinkles! The best part, obviously. 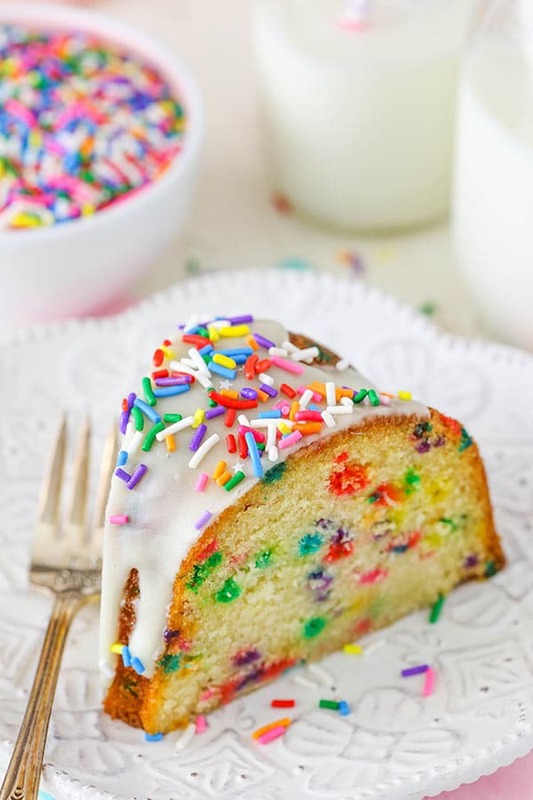 I hope you enjoy this sprinkle-filled cake as much as we did! 1. 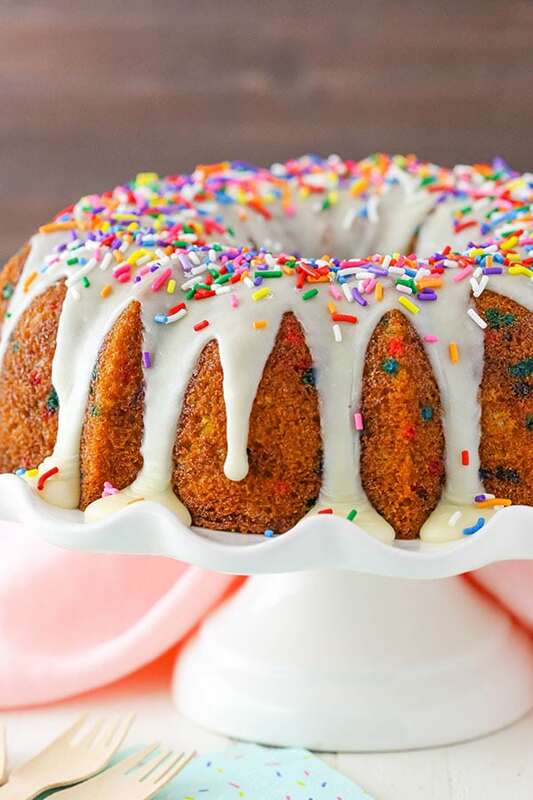 Preheat oven to 350°F (176°C) and prepare a 10-14 cup bundt pan with non-stick baking spray. 3. Add sour cream and vanilla and almond extracts and mix until well combined. 4. Add the eggs one at a time, mixing until just combined after each. Scrape down the sides of the bowl as needed to be sure all ingredients are well incorporated. 6. Add half of the dry ingredients to the batter and mix until well combined. Add the milk mixture and mix until well combined. Add remaining dry ingredients and mix until well combined. Scrape down the sides of the bowl as needed to be sure all ingredients are well incorporated, then stir in the sprinkles. 7. Pour the batter into the prepared bundt pan and bake for about 40-45 minutes, or until a toothpick comes out with a few crumbs. 8. Remove the cakes from the oven and allow to cool for about 10 minutes, then remove to a cooling rack to cool completely. 9. To make the icing, combine all the icing ingredients except for the powdered sugar in a small sauce pan. 10. Heat on low until sugar is melted, then turn heat to medium to bring to a boil. 11. Boil for 3 minutes, stirring occasionally, then remove from heat and immediately pour into a heat-proof glass bowl. 12. Whisk in the powdered sugar and allow to cool slightly and thicken. If you find your icing to be a little thick, just add a touch more water to thin it back out. If it’s too thin, add a little more powdered sugar. 13. Drizzle the icing over the cake while the icing is still a little warm. It will be too firm to pour and get a nice drizzle if it cools completely. Top the cake with sprinkles. Your cake looks moist thus, I will certainly try to bake this cake. I will give you update of the outcome. I dread the thought of painters in the house while we are living here! At least you can sit in a corner and eat this great cake! I actually like the barely pink effect as it is! And I also own tons of sprinkles and rarely bake with them. I like that you kept the sprinkles kind of reserved, not too many. Great cake! I made this and it was AWESOME!! It is one of the BEST cakes I’ve ever eaten. I will defiantly be making this many times over. Thank you so much! My daughter is getting married soon and she wants a funfetti cake, can i use a regular white cake mix and add my own sprinkles? will they hold up or melt while baking? I don’t care for almond extract. Could you suggest a different flavor that might work well or could I just leave it out? I’m anxious to make this cake. My grandson loves sprinkles and this sounds delicious! I’d suggest just replacing it with a little more vanilla extract. 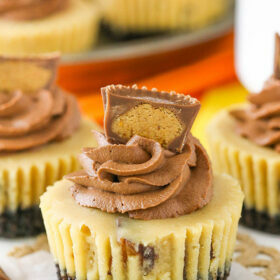 Do you need a stand mixer for this recipe? Or can everything be done by hand? 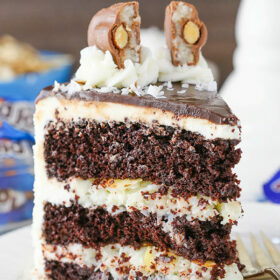 I want to attempt this cake, but already know it won’t look as good as yours! You can use a hand mixer, but you’ll need a mixer of some kind to be able to cream the butter and sugar. 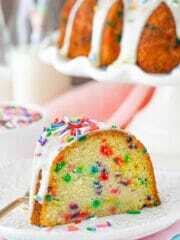 can i make this cake in a loaf pan. I have never tired it in a loaf pan so I’m not sure. It would probably be a good amount of batter that you would need two loaf pans if you want to try it.